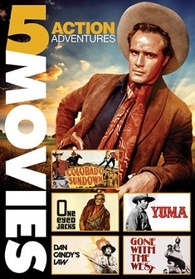 Action Adventure 5 Western Classics from Ill Creek Entertainment with an MSRP of $9.98. Colorado Sundown stars Rex Allen, Slim Pickens and Mary Ellen Kay runs 67 minutes and released in 1952. The heirs to a Colorado ranch look to exploit their timber interests on the ranch at the expense of the cattle ranchers in the area. The heirs are shocked to discover their recently deceased father has also left the ranch to two other relatives. Not wanting to share their newfound wealth or have them discover their plans, the evil siblings decide to eliminate their relatives, just as they had done with an inquisitive forest ranger. What the devious duo didn’t expect to contend with is ranch foreman Rex Allen arriving with his boss, one of the relatives, who uncovers their plans and looks to stop them. One-Eyed Jacks stars Marlon Brando, Karl Malden and Slim Pickens this movie is 141 minutes long and came out in 1961. A pair of bandits makes off with the gold from a bank heist but an opportunity arises where one man takes the gold for himself, leaving his partner to take the blame and face imprisonment in a Mexican jail. Escaping from prison many years later, the wronged bandit searches for his former partner to exact his revenge upon him. The bandit finds his former partner has become a respected sheriff in California and the man still wishes to eliminate the man he betrayed. Yuma stars Clint Walker, Barry Sullivan and Slim Pickens this movie is 74 minutes and came out in 1970. Dave Harmon (Clint Walker) is a U.S. Marshal is sent to the territory of Yuma to bring justice to an otherwise lawless land. All previous marshals have been run out of the territory, mainly due to the actions of Arch King, a man who only works by his laws. The new marshal is set up for shooting a man and it appears that King and some U.S. soldiers are involved in the plot. Harmon is forced to defend himself and expose the corruption in Yuma. Dan Candy’s Law stars Donald Sutherland, Kevin McCarthy and Chief Dan George this movie runs 92 minutes and came out in 1973. Dan Candy (Donald Sutherland) is a Canadian Mountie searching for the Native American who murdered his partner. His relentless pursuit of the killer ends up placing him in extreme peril when the hunter becomes the hunted. Gone with the West stars James Caan, Sammy Davis Jr and Stephanie Powers this movie runs 92 minutes and came out in 1978. Enlivened by star turns from James Caan and Sammy Davis, Jr. we follow the tale of a not-so-reputable hero, Jud McGraw and a less-than-innocent Indian maid, known as Little Moon. They have both come to the deserted town of Black Miller to settle old scores. Out of the smoldering cinders of the town, love finds a way in this delightful romantic western. My Opinion: This movie is for the someone who loves western movies and such a wide variety. This is perfect for my dad as he loves western movies and will entertain him for hours. I love watching old Westerns, especially from the 50s and 60s like Clint Walker as Cheyenne. Hard to believe he's still around, at nearly 90!